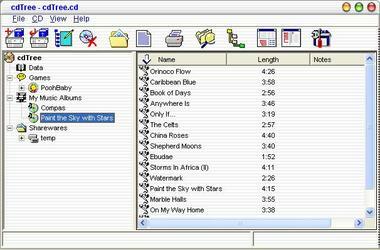 cdTree is an easy to use, efficient and powerful media cataloging tool. It will let you catalog and categorize CDs, CDRs, CDRWs, Hard Disk Directories, Floppies, Zip Drives, DVDs and Audio CDs for offline browsing. It also catalogs zip files contents and present it in an intuitive way. The tool is able to uniquely recognize if a CD has been scanned before and thus avoid duplication in the data. cdTree is very powerful in handling Audio CDs, as it is able to auto detect audio tracks and connect to an Internet CDDB to get album and track information. It also recognizes MP3 files and decodes the MP3 tags within the catalog. cdTree works in two fully customizable modes, the standard mode and an explorer mode. The tool manages many additional attributes including optional notes and user-configurable fields for any of the objects in the catalog, whether it is a folder, a drive, a file or even a file within a Zip catalog. cdTree allows you to work with multiple catalogs consisting of multiple categories per catalog, so you can group your CDs based on their type or location or any other classification. It also enables you to password protect a specific catalog. The tool utilizes Drag & Drop to move CDs and categories around. It also provides a graphical chart to represent the ratios of the free space/used space in CDs for space management. cdTree provides extensive search capabilities, where it can locate any word in any of the fields in the catalog or you can limit your search to the contents of a specific category. The tool will let you launch any file or directory from without leaving the application. cdTree can export catalog data to Excel, XML, Comma Delimited, Single-Page HTML and Multi-Page HTML pages. It also comes with an extensive report generator, where you can produce a professionally formatted reports or DVD/CD Inlays of your CD collection. cdTree is a very helpful tool for people like me who loves storing music files in their personal computers. I create MP3 libraries for my friends so I use this tool a lot and it helps me arrange the songs alhabetically, or sometimes by author or singer. The powerful tool helps me organize music files easily. If I want to look for a cd file or an MP3 file, I just type it on the spce provided by the tool and cdTree will look for it for me. I also use this to get album information.